APRICOT 2019 (25-28 Feb 2019 in South Korea) provides valuable opportunities for all participants to contribute to the discussions on Internet operations, technologies and development. The event will bring together Internet engineers and networking experts, government representatives, Internet business leaders, and other interested parties from around the world to learn from training workshops and tutorials, attend technical presentations, discuss policies, and extend social and professional networks with like-minded peers. 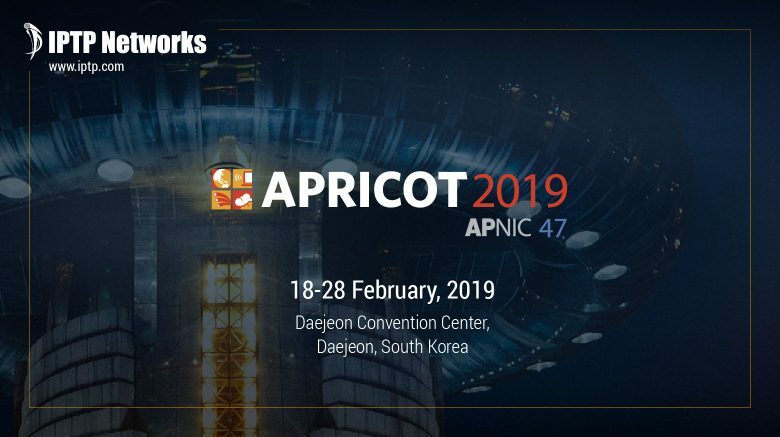 IPTP Networks is pleased to announce that our representatives are attending APRICOT 2019! We would welcome the opportunities to meet with prospects and learn more about the communication, internet, telecoms, infrastructure, datacenter as well as discuss business opportunities and listen to your 2019 business initiatives. We would welcome the opportunities to meet with prospects and learn more about the communication, internet, telecoms, infrastructure, datacenter as well as discuss business opportunities and listen to your 2019 business initiatives.